Golfito took its name from the small gulf that expands into the bigger Dulce Gulf in the western region of Panama. It is the most important town in the southern region of Costa Rica, being a port area and a center of commerce. 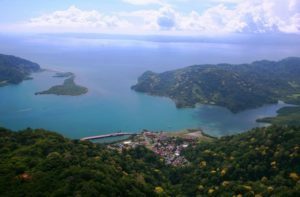 Golfito has emerged as a popular tourist attraction due to its surrounding landscape consisting of luscious hills, forested mountains, a deep bay and the view of the Osa Peninsula in the far distance. You can find the town laid along the main road between the gulf and the lush mountains. And while it does not have too many attractions in its center, Golfito makes a perfect jumping off point for the Golfito National Wildlife Refuge, sitting just on the town’s outskirts. Outdoor lovers and nature enthusiasts usually flock to Golfito to grab the opportunity of exploring this reserve. The more than 1300 hectares (3200 acres) of land that encompasses the refuge was primarily established to protect the Golfito watershed and conserve the animals and rare plant species inhabiting the area. Birdwatching is exciting at the reserve as you can easily spot trogons, toucans, hummingbirds and parrots! If you are in quest of finding the rarest plant in Central America, then head here and seek out the Asian plant species called Caryodaphnopsis. Another primitive plant to look for is Zamia, a type of cycad often referred to as the “living fossils” for being abundant during the era of the dinosaurs. The best way to enjoy the refuge is to take one of the many hiking trails within the area. Golfito National Wildlife Refuge gets a lot of rain, especially during the month of October. If you would like to visit at its driest, come between January to mid-April. Golfito is also an excellent spot for some serious shopping experiences! A duty-free zone has been established here and called Zona Americana. This massive shopping center attracts not only international tourists but also people from around the country who love to go for at least a one-day shopping spree. Taking a boat trip to discover the beauty of Golf Dulce is one of the popular things to do while in Golfito. If you are a fan of sport fishing, then you’re in luck as the waters surrounding town are abundant with game fish like sailfish, roosterfish, and blue and black marlin which can be caught year round. You can easily arrange fishing excursions from the various operators in town. The excursions can come in packages that include the fishing trip and accommodation. If you are up for a more laidback fun in the sun, then consider hiring a boat taxi to get you across to Cacao Beach (Playa Cacao), the nearest swimming beach to the town. 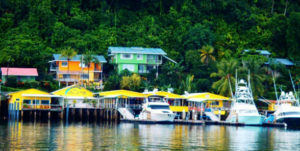 Cacao offers great views of the bay, Golfito port and the rainforest backdrop. Another favorite boat destination from Golfito is the Casa Orquídeas . The cruise to this private botanical garden complex from the town’s public dock is around 30 minutes. Most hotels in Golfito offer a 2-hour tour package to this garden that includes transportation. You may also visit the gardens on your own but take note that you will have to pay an entrance fee and the guided tour around the area, aside from the boat ride. The Casa Orquídeas Botanical Gardens is open daily from 8am to 4pm, except on Fridays. *For a reference map of Costa Rica, click Here. 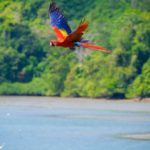 For a Travel Atlas of Costa Rica, click Here.